Drops of Wisdom is a three meter diameter circular interactive table commissioned by the Sydney Catchment Authority for the Warragamba Dam visitor exhibition titled ‘Water for Life’. The Drops of Wisdom table is the central feature in the exhibition. The table displays 40 individual stories in four thematic groups – Water, Catchments, Dam, and People. These stories provide brief insights into the history of Warragamba Dam as well as contemporary aspects of water usage, conservation, and sustainability. A custom developed multi-touch tracking system enables 12 visitors to interact with the display at any one time. The interactive surface enables visitors to ‘catch’ moving icons that seem to drop and splash onto its watery surface. 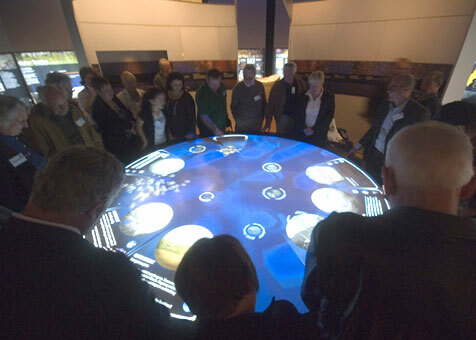 When a visitor touches an icon it moves to a position in front of them and unfolds to present an interactive story tablet that includes scrollable text, video footage, computer generated graphics, and sound. As an added attraction and challenge to younger students and children, a group of elusive platypuses constantly dart across the table. When ‘caught’ they will playfully swim in front of the user. Drops of Wisdom utilises cutting-edge software for interactive 3D graphics, combined with a multi-touch gesture recognition system that makes the entire tabletop touch-sensitive. The 3D graphics are projected onto the table using two edge-blended 1080p high definition projectors, providing a large, seamless and continuous image. Sound is produced in real-time through a multi-channel soundscape that envelopes the installation. Drops of Wisdom was designed and developed by ZedBuffer in association with Bannyan Wood (Exhibition Design and Interpretation), TVU (Film and Video Production), and Sound Environment (Sound Design and AV Integration). To watch 'Drops Of Wisdom' video on youtube please click here.